When you want to tackle some household painting projects but don’t want to use a roller or brush, you will start searching for a paint sprayer. Sometimes, you need a paint sprayer without a cord, so you can take it anywhere. Let me help you find the best cordless, airless handheld paint sprayer. In recent years, battery powered sprayers have not been worth purchasing. They have promised so much but delivered so little. I am very happy to say this new Graco model is the best cordless paint sprayer ever created. Read my full review of the Graco Ultra Cordless Airless Handheld Paint Sprayer 17M363 below to see why. When you are looking for a quality paint sprayer, you’ve most likely run into the sprayers that need to be plugged in. While these have their advantages, there are times when dragging heavy extension cords around your work just isn’t convenient. That is where a cordless paint sprayer comes in. By using a battery, you can essentially take the sprayer anywhere you need to. Be careful not to confuse a cordless paint sprayer with a typical handheld sprayer. Unless it states that it is cordless, most likely it is run by electric. In addition, you will want to choose a sprayer that is made by a reputable company. It should have good reviews from other users as well. The last thing you want to do is purchase a cordless paint sprayer that isn’t worth your money. This is why I highly recommend that you look into the Graco brand no matter which type of cordless paint sprayer you are purchasing. When you need to run on battery, you want only the best battery brand. I was happy to see that this Graco Cordless Paint Sprayer is powered by the DEWALT XR Lithium Ion System. The Triax Triple Piston Pump with ProConnect is made from durable stainless steel. It offers incredible durability with a maximum 500 – 2,000 PSI. These features I have mentioned above showcase the technology that Graco has put into this sprayer. It compares extremely well with their electric, airless range and is once again a top quality Graco product. Read more below to see why these features have helped make this spray gun a top of the range option. 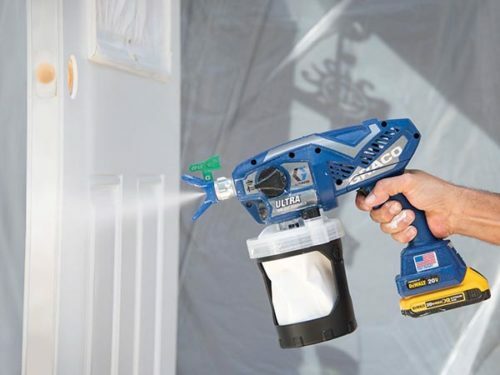 The best part about this cordless paint sprayer is that there is no thinning required. This means you can use heavy materials like latex paints with ease. It is also highly portable due to the 20V Lithium-Ion Battery Pack. Even better is that the battery is made from DEWALT. If anything should go wrong with your paint sprayer down the road, you are going to be happy that parts are replaceable. Many other brands don’t offer replaceable parts and the paint sprayers become trash if something breaks. This Graco cordless paint sprayer is intended for small jobs only. Ideally, you would use this on the small interior or exterior projects. It offers the user the chance to get a quick project done without having to drag out their larger and heavier paint sprayer. When you are relying on a battery, the most time you can expect is up to a gallon. Plan accordingly when taking on a project that it could even be less time than that before the battery needs to be recharged. The other thing related to the battery is that you can only use the 20V batteries that are included with the Graco cordless paint sprayer. This sprayer will only come with a 32-ounce cup. If you find that a larger cup is necessary for your jobs, you can purchase a 42-ounce replacement kit instead. One last thing that needs to be addressed is the price. You are going to pay a premium for the convenience of a cordless handheld paint sprayer. If the flexibility is important to you, then the cost won’t matter because it is a quality product that will last for years. The Graco Ultra Cordless is suited to spraying smaller tasks. I do not recommend it for covering large wall areas. It will just take too much time despite producing a quality coating. This is the best cordless paint sprayer. The Graco Ultra Cordless Airless Handheld Paint Sprayer 17M363 is the way to go. Between the reliability and amazing features, this Graco will help you get those small projects done quickly. If you find that a cordless model isn’t what you need, there are plenty of other Graco paint sprayers that might fit you better.